1. Otitis media is a common condition of the middle ear characterized by fluid. 2. It is diagnosed by looking at the ear drum with an otoscope. Otitis media (OM) -- inflammation of the middle ear. Acute otitis media (AOM)-- acute middle ear infection, generally bacterial. Otitis externa - -infection of external ear canal (not otitis media per se, but can accompany OM). Children with AOM (acute otitis media) usually present with a history of rapid onset of signs and symptoms such as ear pain and/or fever. OTOLOGIC SIGNS AND SYMPTOMS of acute otitis media. The presence of middle ear effusion (fluid) is indicated by fullness or bulging of the tympanic membrane, an air-fluid level behind the membrane, or fluid coming out of the ear (this means there is a perforation). Sometimes one just sees droplets of fluid behind the ear drum. Otoscopic findings of a bulging tympanic membrane with impaired mobility is highly predictive of AOM. A red tympanic membrane is less predictive since the redness may be a flush that comes from crying. However, in an adult, a red TM is modestly helpful. It has been our observation in our practice that there are far more patients with asymmetrical color to their ear drums than have symptoms of otitis media. In other words, it may be pretty easy to "over-call" OM, based on inspections of the ear drum. AOM is generally caused by one of three bacteria: streptococcus pneumoniae, hemophilus influenzae, and moraxella catarrhalis. About 40-50% of AOM is caused by strep, about 20-30 by hemophilus, and about 10-15 by M. Catarrhalis. Resistance of these bacteria to antibiotics are increasing and also there is a change in flora related to use of pneumococcal vaccine, with an increase in H influenzae to roughly 50-60%. Otitis media with effusion (non microbial) -- OME. OME is not generally due to an infection but rather caused by eustachian tube blockage or other non-infective causes (e.g. radiation as an example). The interaction between patulous eustachian tubes and gastroesophageal reflux. It also seems reasonable to presume that some OME is not due to blockage but rather an overly open ET. Some authors suggest that chronic otitis media (COM) is strongly associated with GERD. (Han and Lv, 2018). 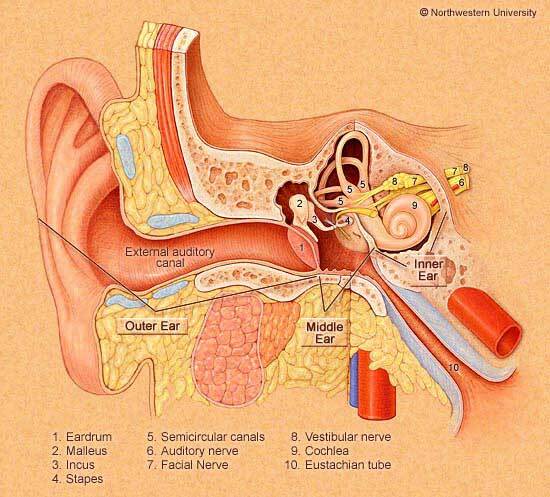 The eustachian tube is a conduit for substances in the nose to enter the middle ear. In addition to bacteria or viruses, this also includes nasal and mouth secretions as well as potentially, stomach acid and enzymes in persons who have gastric reflux. In children, the presence of Pepsin (a digestive enzyme) is correlated with OME (O'Reilley et al, 2008). Refux into the middle ear of the contents of the throat may be especially a problem in situations where the compliance of the middle ear is lowered by a PE tube. We have observed ourselves that occasional individuals on CPAP sometimes develop OME, presumably from reflux of stomach contents into the middle ear. Note that stomach contents might contain both acid as well as digestive enzymes. One would think that opening up of the eustachian tube could be a mixed blessing in OME. It might help things drain out of the middle ear (good), but it might also allow material to reflux up into the middle ear through the ET (bad). Along these lines, Dai et al (2016) reported that dilation of the ET was helpful in 8 adults. This study was uncontrolled and one does not know what would have happened with more conventional therapy. We would think that it would be unwise to dilate the ET in persons on CPAP. Research is lacking regarding the interaction between CPAP, PE tubes and mastoiditis, but one would think that PE tubes might be a bad idea in this population. OME likely has little effect on balance, but treatment of it with tubes is associated with a small and slow increase in balance over 6 months (Cohen et al, 2011). Observation of otitis media without antibiotics but with pain control is an appropriate option for many children with uncomplicated AOM. Antibiotics are recommended in children under 6 months of age as well as patients with severe illness. Luntz M, Yehudai N, Haifler M, Sigal G, Most T. Risk factors for sensorineural hearing loss in chronic otitis media. Acta Otolaryngol. 2013 Nov;133(11):1173-80. doi: 10.3109/00016489.2013.814154. O'Reilley JS and others. - The role of extraesophageal reflux in otitis media in infants and children. Laryngoscope. 2008 Jul;118(7 Part 2 Suppl 116):1-9. Ramakrishnan, K., R. A. Sparks, et al. (2007). "Diagnosis and treatment of otitis media." Am Fam Physician 76(11): 1650-8.